Sri Sacinandana Gaura-hari descended upon the surface of this world adorned with the sentiments and bodily lustre of Sri Radha and mercifully bestowed in charity a type of Krsna-prema which had not been given at any time before during this kalpa. By also instigating the appearance in this world of His eternal pastime associates such as Sri Svarupa Damodara, Raya Ramananda and the Six Gosvamis headed by Sri Rupa and Raghunatha, He distributed that Very specific aspect of transcendental love for Krsna. 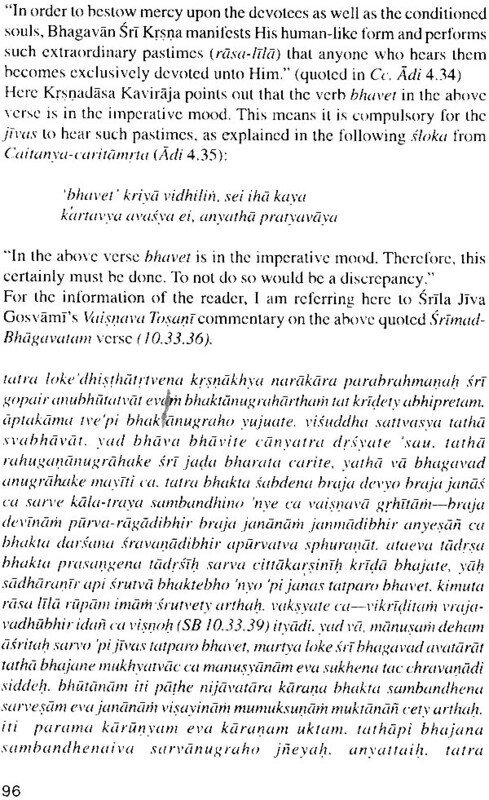 By encouraging devotees from all sectors of society such as Thakura Haridasa, Srivasa Pandita, Murari Gupta, Paramananda Puri and Brahmananda Bharati, to engage in the activities of preaching suddha-bhakti, He made a success of the siddhanta: "kiba vipra, kiba nyasi sudra kene naya." Although Sri Svarupa Damodara was a brahmacari wearing saffron cloth and was considered to be under the authority of the Dvaraka Pitha in the Sankara sampradaya at the time of his residence in Varanasi, he later became Sriman Mahaprabhu's chief assistant. Sri Haridasa Thakura appeared in a family of yavanas (mohammedans) and was not initiated in any particylar sampradaya, yet Sri Caitanya Mahaprabhu conferred upon him the title of "Namacarya". Being extremely magnanimous, He accepted into His fold devotees who had appeared in different castes and creeds and in various countries of Bharat Varsa, In this way suddha-bhakti was preached throughout the entire world in a matter of days. However, nowadays, as in the field of politics, we find that envy, hatred, bickering, insubordination or reluctance in the matter of accepting the guidance of senior authorities and other anomalies, have also entered the arena of dharma. In former times everyone used to deeply revere the axiom "mahajano yena gatah sa pantha" and honour the principle of anugatya, (accepting the guidance of one's respectable superiors). Due to the deteriorating influence of time, some narrow minded modernists want to cut away at the holy thread of anugatya in the ancient parampara-system and destroy friendship between the pure sampradayas. They consider themselves important by inventing an imaginary process of bhajana and then establishing it as authentic. 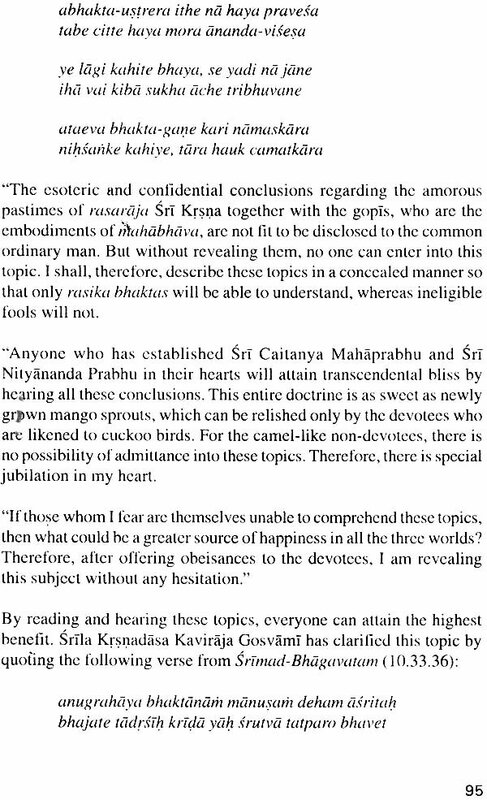 These people who are creating factions within the sampradaya cannot understand that by their ignoble endeavours, contrary to serving the mana 'bhista or innermost heart's desire of Kali-yuga pavana avatari Sri Caitanya Mahaprabhu, they are digging up the roots of the Sri Gaudiya Vaisnava Sampradaya. amanina manadena, kirtaniyan sada harih. Thinking oneself to be even lower and more worthless than insignificant grass which has been trampled beneath everyone's feet, being more tolerant than a tree, being prideless and offering respect to all others according to their respective positions, one should continuously chant the holy name of Sri Hari. 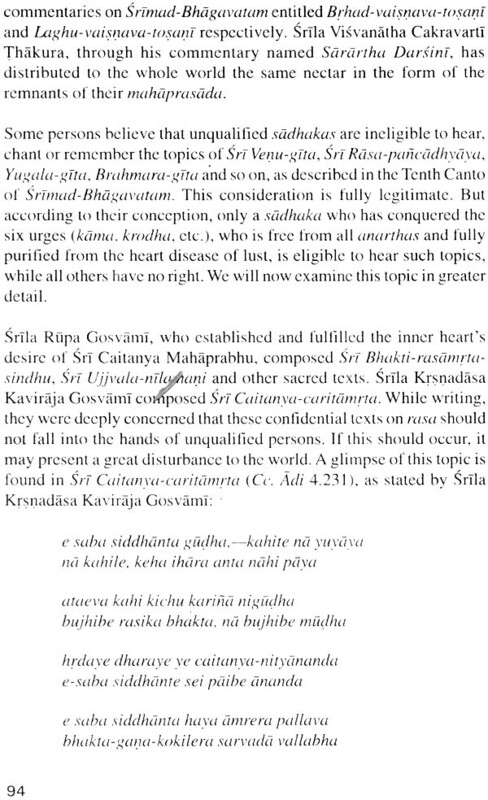 In the light of this verse, where is there any place for enmity and ill-feeling among the members of the pure Sri Gaudiya Vaisnava Sampradaya? What to speak of the other Vaisnava sampradayas of today even in the Sankara sampradaya, we see a unity and anugatya, or adherence to the principles of predecessors, which is lacking everywhere in our Gaudiya Sampradaya. Therefore, with folded hands, it is our earnest prayer that, after deeply and seriously studying this Prabandha Pancakam, the camaraderie within the pure sampradaya may be protected and preserved. In this book there are five essays. 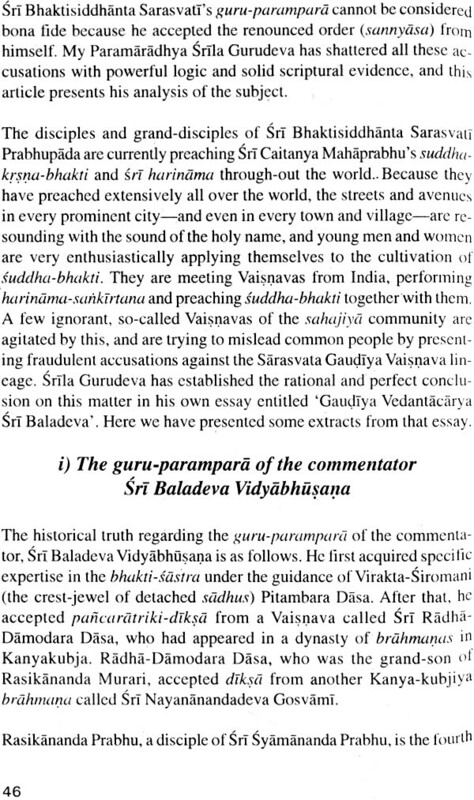 1) The Sri Gaudiya Vaisnava - Sampradaya and Sannyasa. 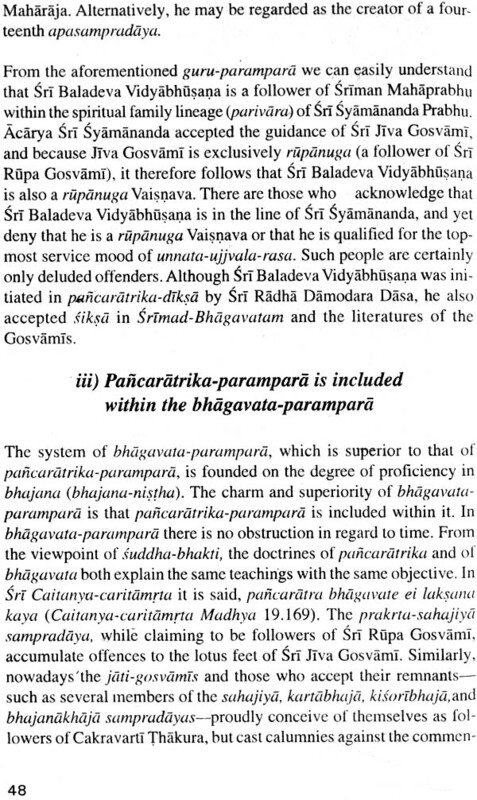 2) Pancaratrika and Bhagavata Guru- parampara. 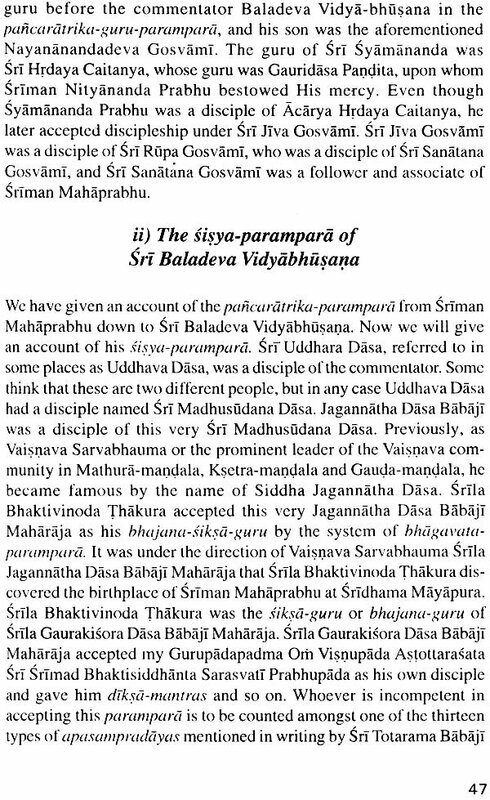 3) The Gaudiya Sampradaya is in the Line of Madhvacarya. 4) Babaji Vesa and Siddha-pranali, 5) The Eligibility to Hear Rasa-lila Katha, I wrote the first of these essays fourteen years ago and it was published in Sri Bhagavata Patrika in the Hindi language (year 4, issues 2 to 4). The second, third and fourth essays have been selected from my composition entitled "Acarya Kesari Sri Srimad Bhakti Prajnana Kesava Gosvami - His Life and Teachings." 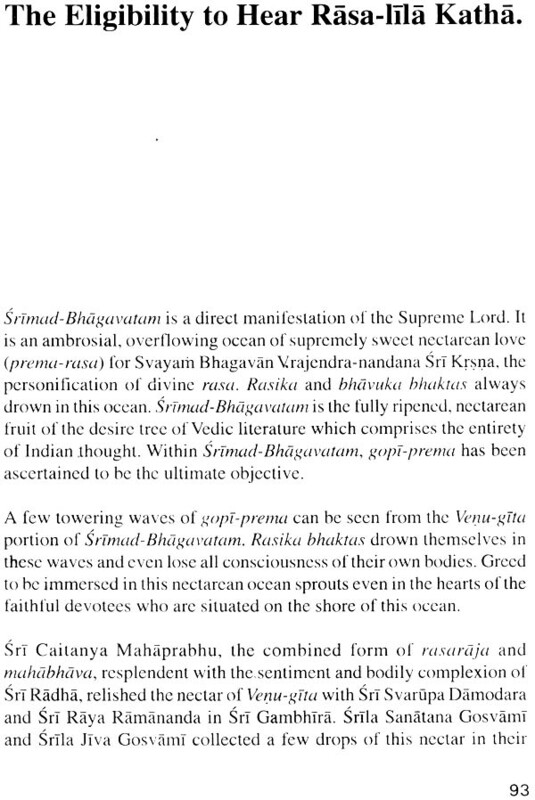 The fifth essay was written as an introduction to my commentary on the Venu-gita of Srimad Bhagavatam entitled. "Ananda Varddhini". In the couse of writing these essays, it was inevitable that the names of persons, past and present, who have encouraged various unfavourable opinions, would be mentioned therein. Nevertheless, it was not my intention to make anyone look insignificant or minimize anyone out of malice. If reading these essays causes pain to anyone's heart then I beg for forgiveness.